There’s a single moment of absolute magic that unfailingly captivates every adult minion serving time with their indulged charges at this unnecessarily tedious exercise, said charges even more enthralled by said moment. At one point in the lugubrious, overstuffed, undernourished first act, _yes, yes, all necessary story build up, but still, where were the pros? -- little Charlie Bucket, impassioned by his dream of winning a gold ticket to permit him entry into the mysterious Willy Wonka’s hallowed chocolate factory, little Charlie Bucket, played in this turn by Ryan Foust, one of the trio of Ryans entrusted to enact this gem of a role, little, wistful, poignant Charlie throws a paper airplane out over our heads into the audience and it sails up into thin air and vanishes. Wow. 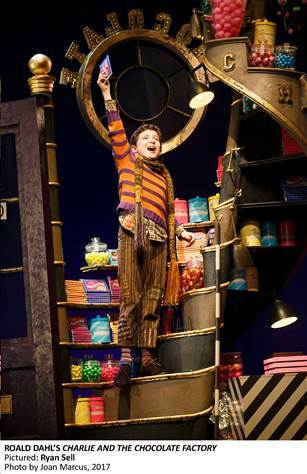 It ‘s message: Charlie’s dearest wish, to see inside Willy Wonka’s chocolate factory. 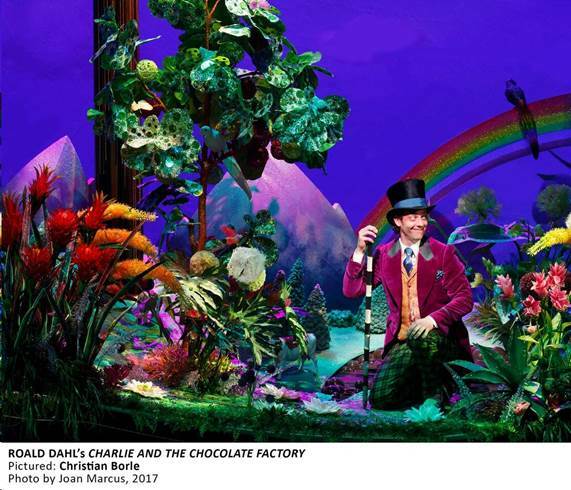 We know darn well why we’re here, to see inside that chocolate factory, so we know it’s going to happen, there isn’t a one of us who has not seen one or both film versions of Roald Dahl’s chocolate dark children’s book which has sold a zillion copies. Giving musical book writer David Greig whole bags of kittens trying to make it all happen on the stage, the music and lyrics by Mark Shaman and Scott Whitman just serviceable in spite of sprightly direction and supervision by Nicholas Skilbeck. (How wise to keep “The Candy Man” and “Pure Imagination” by Anthony Newley and Leslie Bricusse, show hits from other incarnations). And, of course, we do. Get to see the wondrous insides of that fabulated factory. After we’ve met Charlie and his grandparents, all four of them, Grandpa Joe (John Rubinstein), Grandma Josephine ( (Kristy Cates), Grandma Georgina ( Madeleine Doherty) and Grandpa George (Michael Williams) in their bed, where they’ve been for forty-five years, having given up on the world. Leaving their care and feeding in the hands of Charlie’s mother, Mrs. Bucket (marvelous Emily Padgett). And, of course, Charlie. 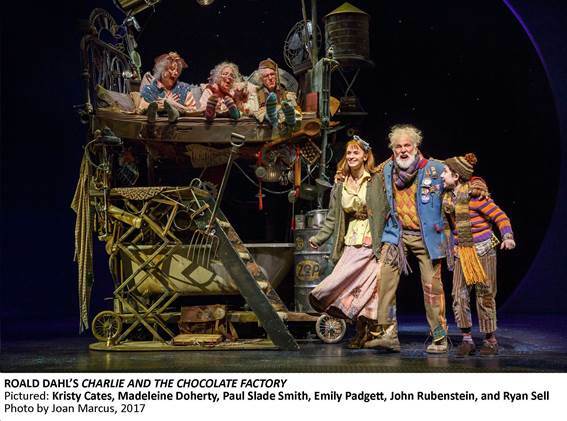 They all know Charlie’s dream: to get one of the five winning tickets, hidden in Willy Wonka chocolate bars all over the globe. Five lucky kids are going to get to see the wonders inside Willy Wonka’s chocolate factory. But how can Charlie even buy a chocolate bar? He’s too poor. In fact, all of the Buckets are too poor to give him enough to buy a chocolate bar, they just have enough pennies to buy second hand cabbage for cabbage soup. If this is too grueling for you, you might as well know now that Charlie does manage to get the very last gold ticket hidden in a slightly used chocolate back wrapping and there’s joy in this shabby world. 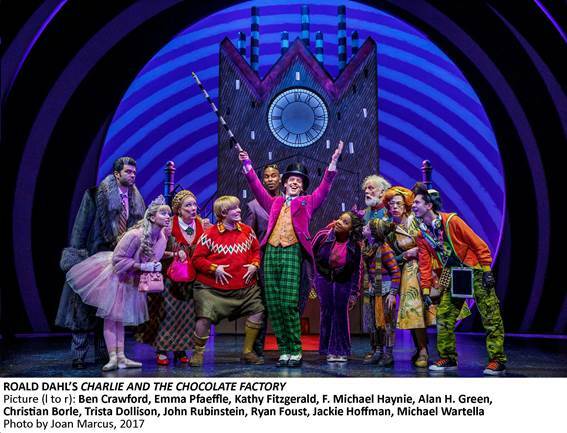 And all the children and their responsible adults (required) come to the doors of the chocolate factory, agog, of course. And finally, finally we meet Willy Wonka. (Finally we meet absolutely essential Christian Borle). Oh, yes, we knew that was he in disguise in the first act but now, he’s not in disguise, he’s in brrrilliannt color. And so, for that matter, are the five lucky children, and so, for that matter are we, lucky, that is, because the second act finally gets up and gets to the good stuff. Meaning Christian Borle, Christian Borle, Christian Borle, and his Willy Wonka shivaree. Yes, John Rubinstein charms as Grandpa Joe, and yes, Ben Crawford surprises as Mr. Salt, and Jackie Hoffman does a blessedly tamed down version of herself as Mrs. Teavee, and Alan H. Green makes a giddily exuberant parent for Violet Beauregarde (Monette McKay) who adores herself so much she’s ickier than Veronica Salt (Emma Pfaeffle) who is so in love with her entitlement to be the grabbiest she not only outgrabs Augustus Gloop (F. Michael Haynie)stuffed and smiling, she outmonsters Michael Teavee,( Michael Wartella) which is almost impossible. Well, you know what bad behavior earns. Admonishment. But in author Roald Dahl’s hands, that amounts to fanciful and picturesque dismemberment which is supposed to amuse us. Sorry, Dahl. That is sick, that is. And if it weren’t for the distraction of the Oompa Loompas whose grossly clever antics are not to be believed, we might just be injecting trauma into small minds. Hmmm. That sounds ominous. So be it. Multi-award winner director Jack O’Brien keeps the wizardry of Mark Thompson’s sets – Thompson also did the required overboard costumes that children are supposed to lap up -- working like a well greased machine, but everything depends on the ultimate chemistry between wistful, almost real Charlie and outlandish, not at all real Willy Wonka and it isn’t quite there. But it never was, in the Dahl original. Charlie and the Chocolate Factory. At the Lunt-Fontanne Theatre, 205 West 46th Street. Tickets: $69-$358. 2hrs 30 min.